Photographic theme: Images from my recent trip to Haines, AK. Canon 600mm f/4 L IS lens IS lens with the 1.4X II TC and the EOS-1D MIII. ISO 1250. Evaluative Metering +1 1/3 stops off the water in the river set manually. Many of the fight images that I created featured gravel backgrounds that were quite unattractive. First, I tried selecting the background with the Magic Wand Tool and doing a Gaussian Blur on the selection. 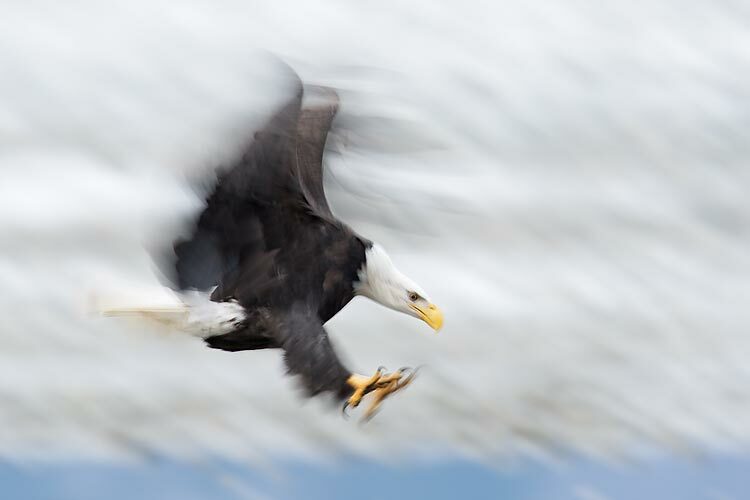 Whether or not I feathered the selection the edges of the eagle's wings were severely blurred. Then I simply selected the background with a Quick Mask and blurred the selection on its own layer using a Gaussian Blur. Canon 600mm f/4 L IS lens IS lens with the 2X II TC and the EOS-1D MIII. ISO 1000. Evaluative Metering +1 stop; exposure verified by histogram check: 1/125 sec. at f/8. Fill flash at -2 stops with Better Beamer. This bird allowed close approach by a small group of photographers keeping their tripods low. He screamed often at other birds that landed nearby. I arrived at Bosque on Sunday, November 11, 2007. I was dismayed to note that photographic conditions this year are extremely poor. This is my thirteenth consecutive year of visiting the refuge in late fall, the last 12 for from two and one-half to four weeks in November and very early December. On each of those visits most days found large numbers of geese and cranes in various locations close to the tour road, and huge blast-offs of geese were a common occurrence. In addition, the water in the main impoundment was deep enough to attract thousands of geese that blasted off in the pre-dawn and then landed in the main impoundment. This year there are few if any birds to be found anywhere near the tour road, and the fly-in to the main impoundment is a thing of the past because the impoundment has been allowed to become overgrown and resembles a field much more than a pond. When I picked up my permit for the three IPTs I was told that my group would need to attend a photographers orientation meeting. You can find some of the details of this meeting below. Sandhill Crane numbers at present are about half of what they are in an average year because of the unseasonably warm weather, and there are more than 25,000 geese, about average for this time of year. On the first IPT we worked very hard to get the group in the best positions to enjoy some great photography but for the most part that was a great challenge. The folks on IPT #1 were understanding of the issues involved and appreciative of our efforts. We shall do our very best for the folks who will be attending IPTs #s 2 and 3. While there are still some good photographic situations to be found, I would--at the present time--recommend that folks planning a visit to the refuge this fall strongly consider putting their visit off to another year in hopes that the situation will improve. The two crane pools that were dry last year have been filled and opportunities there are improving daily. There have been some large flocks of blackbirds around. If conditions in general at the refuge improve significantly before my departure, we will advise you of such developments immediately via Bulletin. (Up to the minute details as to where and when to find the best opportunities will be included in the update to the Bosque Site Guide which we will send next week. To learn about BAA Site Guides, click here: http://birdsasart.com/siteguides.htm. Hope that all is well. All here in Socorro is A-OK. I appreciate your cutting windows along the east Farm Loop Road, having water put into the two crane pools, and clearing the area along the pool at the south end of the refuge. The latter two have improved photographic conditions (while the lines of sight to the impoundments on the east Farm Loop Road are still for the most part obstructed). I am writing to you about several issues of great concern to me. The folks in my group felt as if they were being singled out as potential violators of refuge policy since neither birders or birding groups were asked to attend. We were told that if a goose raises its head while we are photographing it that we are causing considerable disturbance that can lead to outbreaks of avian cholera. In the next breath we were told that the hunting of white geese is permitted on the refuge and that the killing of geese is a good thing because Snow Geese are over-populated in North America to the tune of 8 million birds. I know that this information is correct and that large areas of the arctic are being denuded by the geese. When a hunter fires their gun it would seem that as many as several thousand geese might be flushed thus raising their basal metabolic rate at least 15 times normal, and it would absolutely follow that these stressors could also lead to outbreaks of cholera. It is simply impossible to believe that minimal disturbance of the geese by photographers is unacceptable while the killing and gross disturbance of geese by hunters is acceptable. #2: Photographic conditions at the refuge are poorer by far than in any of my twelve previous two and one half to four week visits. In five days of visits to the farm fields in both morning and afternoon there have been virtually no opportunities to photograph either single geese in flight or the legendary blast offs of large flocks of Snow Geese. During all of my previous visits during this same time period (from NOV 12-DEC 5) such opportunities abounded on most days. It seems that the only corn that has been knocked down this year is at great distances from the road. and it is evident that corn in the far northern reaches of the refuge has been knocked down as we have frequently observed distant blast-offs of large flocks of geese. Also, with the area around the flight deck and much of the main impoundment so overgrown as to resemble a large field, the large flocks of geese that traditionally settle down into this impoundment during predawn have failed to do so. Again, this is contrary to my experiences over the past twelve years. And this spectacle had always been one of the very great highlights of a Bosque visit. At present, the viewing opportunities from and near the Flight Deck have been hugely disappointing to those of us who have visited the refuge in prior years. While there is a field of corn on the Farm Loop Road about 1/2 mile before the parking lot for the Phil Norton Photographic Blind, none of that corn has been knocked down. If you could arrange to have a single row of that corn knocked down ASAP, it would go a long way towards improving the photographic opportunities at the refuge at a time when large numbers of photographers and bird watchers are visiting. While I understand the need to rotate crops and to manage the refuge first for the wildlife, it is both very disappointing and hard to understand how and why photographic and viewing conditions at the refuge are so poor at present. In the years from 1994 until about 2000 or 2001 or so, the refuge was managed first for the birds, and then for the visitors (including the photographers). Over the past few years, the concern for the viewing and photographic opportunities have diminished, and this year it seems that the refuge is being managed against the visitors and the photographers. At the meeting, I mentioned to Biologist Vradenberg (please let me know if this is the correct spelling of his name) that the vegetation on both sides of the ditches along the northern sections of the Farm Road were so high in most places as to block the views not only of the few geese in the fields but of the birds in flight as well. This of course hampers both the birders and most especially the photographers. His response was that the work force at the refuge had many more important things to do and suggested that if I wanted to be able to see and photograph the geese that I should come to the refuge in the summer and do the work myself. Most of the folks at the meeting, and there were at least 50 of us, took this as a direct slap in the face. "We do not care one bit about either the visitors or he photographers," was what most folks made of that comment. I would however like to take the biologist up on his offer. Please send me his e-mail address. Thanks. #3: Since the institution of the $150 fee for each (complying) photographic group that applies for a permit, photographic and viewing conditions at the refuge have gotten worse each year. #4: Most of the photographers whom I have spoken to have been complaining about the photographic conditions at the refuge and lots of visitors, including many of those who are currently attending the Festival of the Cranes, have commented that the viewing opportunities during daylight hours are greatly diminished this year. As word gets out, this will surely reduce the number of folks visiting Socorro and the refuge and in very short order will most certainly affect the economy of the town and refuge revenues as well. Much of the visitor's discontent has been relayed to me by various motel and restaurant owners. The economic impact of reduced visitor-ship in the area will certainly range from substantial to devastating. Folks come to the refuge to see and photograph the geese and the cranes; we are your allies in both conservation and the fight for adequate funding. When we met last year and had our ride-around (thanks again for that opportunity), I mentioned that I would be more than glad to do anything in my power to help Bosque become the great photographic destination that it was up until about the turn of the century. That offer still stands. Please acknowledge the receipt of this e-mail. And please let me know which of the two e-mail addresses is best for you. UPDATE: The orientation meeting with the Bosque IPT #2 group with Biologist Vradenburg went much better than the first. He explained that their plans to have lots of birds by the Tour Loop Road were foiled by Mother Nature and that she also messed up their plans for the Main Impoundment. They planted lots of winter wheat in the far northern parts of the refuge. The birds usually ignore this crop, but because of the ridiculously unseasonably warm weather--we were all in shirtsleeves on Sunday afternoon--the wheat has sprouted seed and is only a few inches tall, and the birds have been devouring it while at the same time ignoring the sorghum that was planted adjacent to the Farm Loop Road at the north end. The problem at the main impoundment has to do with a species of invasive plant that they thought could be controlled. The great news is that the main impoundment will be disked (or disced--it seems that both are acceptable usage) next summer so that it will be a lake next year as it was last in about 1994. I will continue to try to develop a good working relationship with refuge management staff in hopes of restoring Bosque to its former greatness. Canon 600mm f/4 L IS lens IS lens with the EOS-1D MIII. ISO 640. Evaluative Metering +1 1/3 stops off the water in the river set manually: 1/60 sec. at f/4. 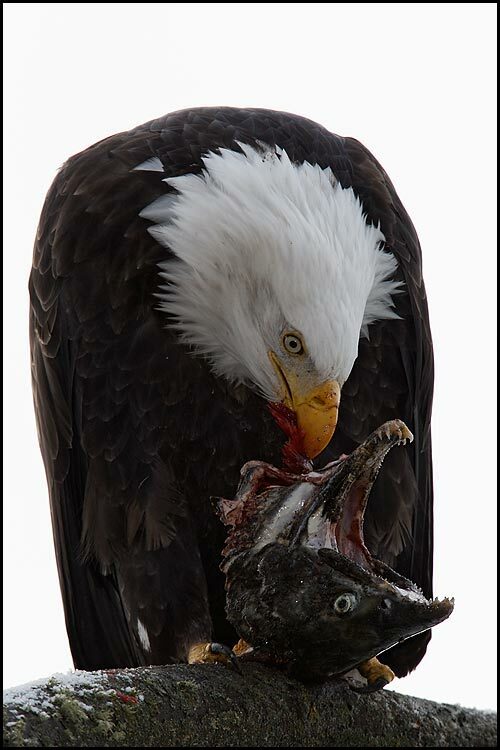 The eagles were constantly fighting over salmon carcasses. It seemed that the bird that flew in to attack a bird already on a salmon almost always drove the other bird off. On Friday, NOV 2, I flew from Orlando to Seattle and was picked up at the airport by Hal Murlein, a member of the Nature Photographers of the Pacific Northwest. Hal drove me to the Corbis offices in downtown Seattle where I did a short program. My agent, Dave Ross, had arranged for me to share some of my work with the Corbis sales team. A good time was had by all. Hal then drove us down to Vancouver, Washington. There, the next day, I presented two programs for the group. Early that Sunday morning I flew from Portland to Seattle to Juneau, Alaska where I caught a tiny plane piloted by a guy who looked about 16 years old... We arrived safely in Haines in about 35 minutes. Christa, of the American Bald Eagle Foundation, picked me up and brought me to my motel. 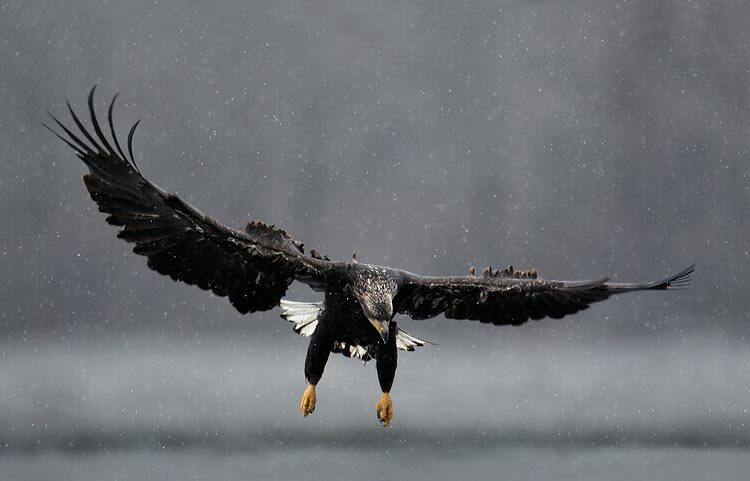 I spent all day Monday and Tuesday photographing Bald Eagles at the Chilkat Eagle Preserve about 21 miles from town. Ron Horn, a fine local photographer, helped me find the best spots quickly and loaned me his beanbag. Thanks Ron! And I met my friend and fellow professional Weldon Lee who has been bringing photography groups to Haines for many years. 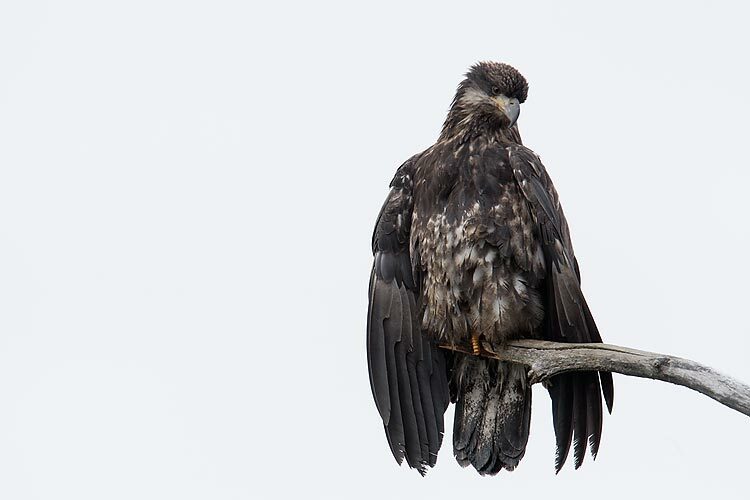 Each fall more than 3,000 eagles gather along a four-mile stretch of the Chilkat River north of Haines to feed on a late run of chum salmon. This wildlife spectacle is the largest gathering of eagles in the world. Warm water upwellings in the river keep this stretch of the Chilkat River ice-free providing access to the fish when food supplies are exhausted elsewhere. 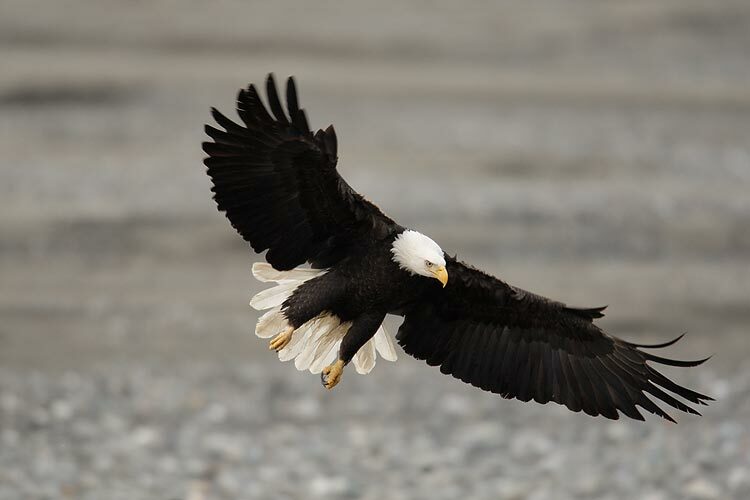 Eagles fly in from as far away as Washington State to partake of the abundant feast. 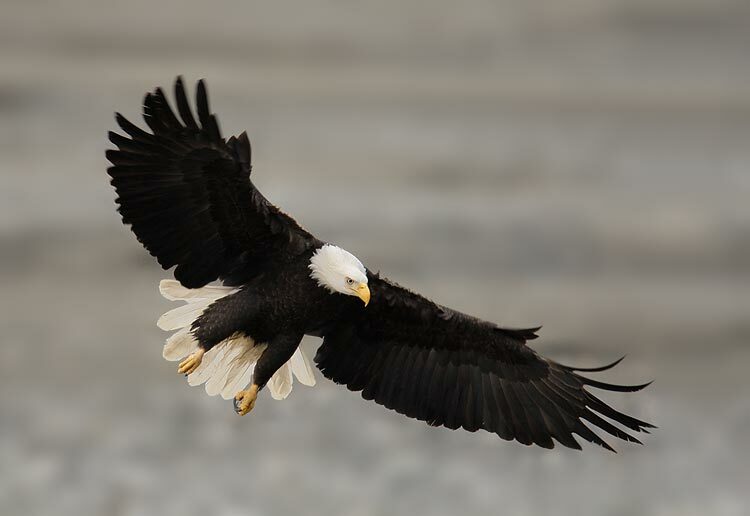 Beginning in late October eagles by the hundreds can be seen along the sand bars and in cottonwood trees that line the river. 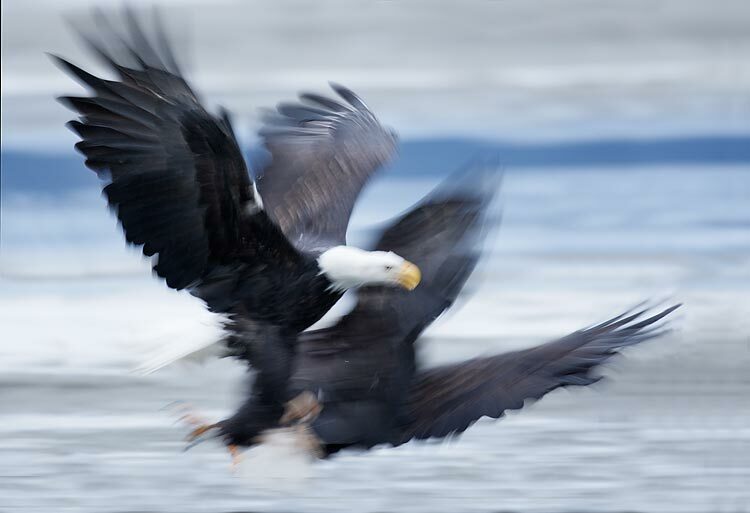 I was honored as the Haines Bald Eagle Festival Wildlife Photographer of the Year. The honored artist was Randall Compton. As he has an interest in photography we got along in fine fashion. Also speaking at the event was Michael S. Quinton, an incredibly gifted photographer who has done many Arctic-related articles for National Geographic. 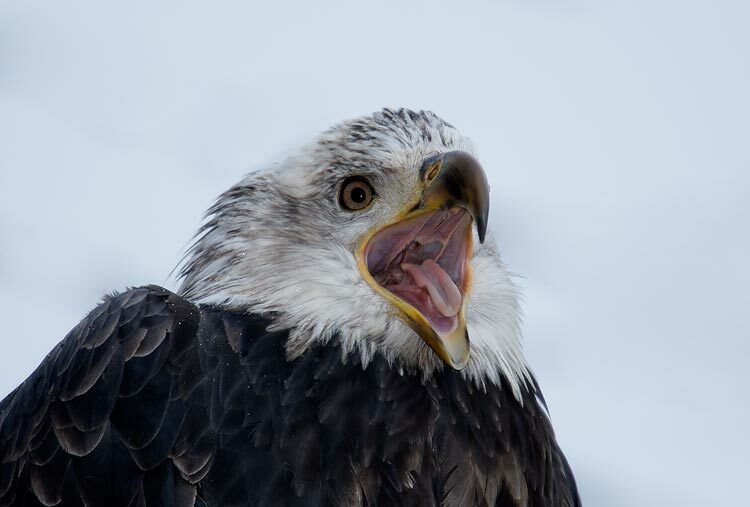 On Wednesday and Thursday I did several educational programs and on Friday, many of the folks who had attended the indoor sessions joined me for one last chance to photograph the eagles. Opportunities were good. There were lots of birds scavenging the salmon carcasses, and many perched in the trees along the highway and the river. Most were on cluttered perches but there were some clean perches that were not too high. And there were several eagles that allowed close approach. Ron said that because the channel was much wider than average the photo opps in 2007 were not as good as they had been for the past few years. The weather for all three of my photographic outings ranged from overcast to cloudy-dark. I was glad for that as it would be nearly impossible to get a decent sun-angle on the eagles had it been a clear day. That Friday afternoon at 7pm I presented one of my most popular programs, BIRDS AS ART on the Road for the festival attendees. I had been scheduled to fly to Juneau on Saturday on the tiny plane that I had arrived on but all of the locals cautioned me against doing so as the weather often causes cancellations. The only other option is the ferry but none were scheduled for that Saturday so at 8:15 pm on Friday night, minutes after I had finished my program, Ron drove me to the ferry dock. I had arranged for a stateroom so that I could sleep the night away as we made our way to Juneau. I arrived in Juneau at 7am on Saturday morning and grabbed a motel room. It was a nice day in Juneau and the locals there suggested that I get out of town while the getting was good as many flights that week had been cancelled due to fog. So I changed my flight to Seattle to late that Saturday night and spent the night there. I finally made it to the Super 8 Motel in Socorro at about 6:30pm on Sunday evening. Door to door from Haines to Socorro had taken about 46 hours. It is not an easy place to get to but the wonderful folks and the wonderful eagles made the trip well worthwhile. Canon 600mm f/4 L IS lens IS lens with the 1.4X II TC and the EOS-1D MIII. ISO 1250. Evaluative Metering +1 1/3 stops off the water in the river set manually: 1/500 sec. at f/4. This bird flew in front of a stand of distant trees that provided a lovely dark background. It snowed only a few flurries very briefly during my Haines visit. The previous year there had been two feet of snow with a temperature of -20 degrees Fahrenheit. I received the e-mail below from Bosque IPT #1 participant Earl Orf. Hi Art, I would like to thank you and all the posse members, Jim Neiger, Robert O'Toole, and Glenn Wheeler; I really enjoyed the workshop and learned a lot. It is pretty simple, actually, and the basics are in both of my how-to books, I think. If the background is changing fairly often and fairly quickly (as you point your lens up or down, left or right) then it is best to work in Manual mode. If the light is constant this is easy to do once you have determined the right exposure via a histogram check. If the light is changing constantly as the sun peeks in and out from behind the clouds, Manual mode is still best but you will need to be changing your settings each time that the intensity of the light changes. Manual mode is also called for if you are working close to a large subject that has areas of black and/and or white plumage. First, determine the correct exposure via a histogram check. If the subject has white or light areas, you need to be sure not to burn the highlights while making sure that you have data in the fifth histogram box. Once you have determined the best exposure, set it manually. That done, you will always have the right exposure regardless of your framing. If you are working in Av mode, then your exposure compensations would need to be changed constantly as your framing changed and the amount of light or dark areas effecting the metering changed. If, however, the background tonality is fairly constant I find it much easier to work in AV mode; then I only need to change the exposure compensation when the light changes. When working in manual mode I would often need to change both the aperture and the shutter speed. Making one change is easier and faster than making two changes. In the pre-dawn at Bosque I find that working in Av mode at +1 stop will give you a workable exposure pretty much wherever you might be are pointing your lens. If the birds fly through a section of very white sky as they depart to the north, I simply dial in 1 2/3 stops of overexposure (+1 2/3). When I am at the beach and most of the backgrounds are light toned (as in sand or sky), I often use Av mode as well. Lastly, if I am trying to create pleasing blurs, I always work in Tv mode to maintain complete control of the shutter speed (and thus complete control of the degree of blurring). I hope that this explanation has helped you. Later and love and thanks again for joining us. To learn the basics of working in Manual mode, click here: http://www.birdsasart.com/bn193.htm and then scroll down. Canon 600mm f/4 L IS lens IS lens with the 1.4X II TC and the EOS-1D MIII. ISO 800. Evaluative Metering +2 1/3 stops off the white sky: 1/200 sec. at f/10. Flash at +1/3 stop with the Better Beamer. With this bird in a shaded area on a white sky day I knew that using lots of flash would help give me clean-looking whites. If anyone knows of a good new Zealand birding guide please contact Gill Arden at mgarden@rogers.com. Thanks! Canon 600mm f/4 L IS lens IS lens with the 1.4X II TC and the EOS-1D MIII. ISO 800. Evaluative Metering +2 1/3 stops off the white sky: 1/200 sec. at f/8. Fill flash at - 2 stops with the Better Beamer. This young bird sat on one of the very few clean, attractive perches. Of several keepers, I liked this one with the bird looking out of the frame; it gives a mood of inquisitiveness to the image. David Kennedy, a fine young photographer and a multi-IPT veteran, has posted an on-line gallery of his favorite image from the last Gustaphoto/BAA Kenya Photo-Safari. David has many excellent images and is an expert at creating stitched panoramas. You can view his gallery here: http://davidkennedy.zenfolio.com/f737637589/. Canon 70-200mm f/4 L IS lens with the EOS-1D MIII. ISO 400. Evaluative Metering at zero: 1/1000 sec. at f/9. 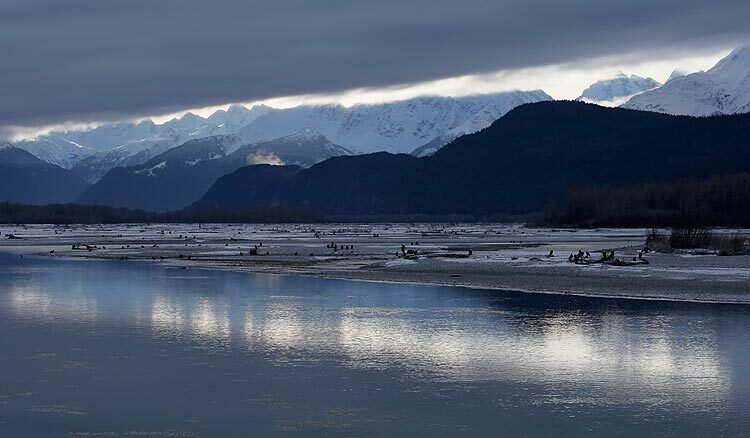 This type of image, called an establishing shot, which sets the scene, would be very useful if I were to try and sell an article on the Chilkat Eagle preserve. Some folks call images of subjects other than the birds or wildlife that you are photographing a"B-roll images." PORTLAND, MAINE, "The Art of Nature Photography; It Ain't Just Birds Weekend Seminar"
This seminar is for all nature photographers who want to learn how to make better photographs. On Saturday I will describe the methods and techniques that I have developed and used since 1983. My comments on equipment (including and especially digital equipment), autofocus, light, and on composition and image design, and my tips on getting close to free and wild subjects and creating pleasing blurs will benefit everyone with a telephoto lens who wishes to dramatically improve the quality of their images. Since going all-digital in November 2002, I have--in short order--become a digital photography and Photoshop expert. My approach to optimizing images is to create a master file of excellent quality in the shortest possible time. I will share our workflow and numerous Digital and Photoshop tips on Sunday. As more and more folks are using Digital Capture, I am finding on our IPTs that many good to excellent photographers have no clue as to how to use Photoshop to make their images look better. In fact, many of them make their best images look worse! My workflow is designed to quickly produce master files of high quality. I can and will teach you to do just that at this seminar. To register, send a check for the full amount made out to "Arthur Morris" to PO Box 7245, Indian Lake Estates, FL 33855, call with a credit card: 863-692-0906, or send a PayPal (using either any link on our site or your PayPal account) to us at birdsasart@att.net In all cases, we will need your e-mail address, your mailing address, and your daytime and evening phone numbers. Here is our Cancellation Policy: If for any reason you need to withdraw, please notify us ASAP. Once we receive your e-mail, phone call, or written notice of your cancellation the following fees apply: cancel before July 10, 2008 and your fee will be refunded less a $20.00 cancellation fee; cancel by August 10, 2008 and your fee will be refunded less a $50.00 cancellation fee; cancel after September 10, 2008 and there will be no refund. Canon 600mm f/4 L IS lens IS lens with the 1.4X II TC and the EOS-1D MIII. ISO 640. Evaluative Metering +2/3 stop: 1/125 sec. at f/5.6. Fill flash at - 2 stops with the Better Beamer. More B-roll. 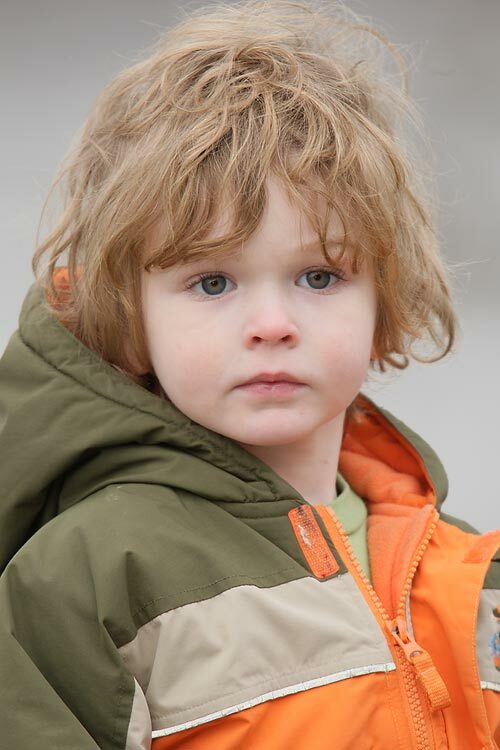 I am a sucker for cute little kids. And remember, it ain't just birds; the principles that go into creating good images of birds and other natural history subjects are the same whatever you like to photograph. San Diego IPT: Jan 20-23, 2008. Slide program on the Saturday early evening of JAN 19. 4-DAYS: $1399. (Limit 12: Sold Out) LaJolla, LaJolla Shores Beach, Coronado, and Santee Lakes. Brown Pelicans in spectacular breeding plumage, Heerman’s & Western Gulls, Marbled Godwits & lots more shorebirds, Wood & Ring-necked Ducks & Lesser Scaup. Great flight photography. And lots more. SW FLA President's Holiday IPT: MAR 17-21, 2008 5-DAY: $1669. (Limit 14; 6 openings). Slide program on the evening Sunday, MAR 16, 2007. Co-leaders: Robert O’Toole, Alfred Forns, Fabiola Del Alcazar, & Robert Amoruso. Sanibel Island, Little Estero Lagoon, Venice Rookery, Cape Coral. Herons, egrets, gulls, terns, skimmers, shorebirds, both pelicans, Osprey, Burrowing Owl, and lots more. Canon 600mm f/4 L IS lens IS lens with the 1.4X II TC and the EOS-1D MIII. ISO 200. Evaluative Metering +1 1/3 stops off the river water: 1/30 sec. at f/8 set manually. If you concentrate on perfectly matching the speed of the subject as you pan it is possible to get the eye sharp even at very low shutter speeds. As I wanted to create a pleasingly blurred image, I chose a low ISO to avoid using a small aperture. 600mm f/4 L IS lens IS lens with the 1.4X II TC and the EOS-1D MIII. ISO 200. Evaluative Metering +1 1/3 stops off the river water: 1/30 sec. at f/8 set manually.